Win the Test series even if you lose all the limited over matches. No one will remember these One day games in years to come. They are fun to watch but can be a lottery at times. This. But the problem is South Africa will smash us in the tests as well. There's only so far we can get with a 'decent' (and nothing more) team. Any improvement on this front? I expect that to improve soon. He scored a quality hundred against Aus in Aus recently IIRC. He is one of the dozen other batsmen who were mediocre/good in the 2000's and suddenly turned into a beast batsman in the 2010's like Taylor, Sanga etc. Even Raina destroyed England in England recently. He will come through on this front soon. We have 1-2 batsmen and 1-2 bowlers for this series. Rayudu and Gurkeerat seem risky choices. @sensible-indian-fan is Naman Ojha in the squad? I remember when everyone hated him, and now everyone is bowing down to him. Currently the best Indian ODI batsman. Kohli's form is confusing. He is about to overshadow Kohli. Provided he has a good Test series especially. I think he will have a terrific Test series. You never know he may be the next captain as well. too many heart breaks these days. i am having a real bad time as a fan. But what about the pain that we are feeling now. I've been consistently supporting him for a reason. He's a beast when set. Only ABD comes close. I t think we should play him in Tests as well. Now I've said the opposite in the past but these are home tests and Rohit gas only played two tests at home two years and our batting stocks are poor in Tests. Might be worth it looking at his form. He will play home tests and he should. Overseas tests he shouldn't, atleast not for the time being. Getting up there certainly with the likes of Sehwag as a FTB. Guys like you need to recognize that nowadays 85% of tracks are flat, and therefore FTB is pretty much world-class batsman and this is a more relevant skill than battling it out in difficult conditions. Remind me what his ODI average is outside India ? Average of 69 at home compared to 30 away. its mid 30s if i recall correctly. I think that's game, set and match to me then. Fair play to you then. Only current Indian batsman that can play crucial innings. Has to improve on a lot of things but still India's best batsman as I have stated. Will rarely scored soft, needless runs like Kohli did in Australia and often does or like Dhoni is doing for the last 7 years of his career. That six to Tahir was MASSSIVE! What a player under pressure. Bhai kuch ziada nahe hogya? Backed by performance. So what is surprising about the comment made. Rohit is currently the most dangerous ODI batsman in the world. Best Indian batsman in LOI's. And I am sure he can also do it in tests. Really has got something special about him. Most dangerous might be pushing it; on form, Kohli is better than him, even. haha why the obsession with me? Which is the point. Kohli isnt in form. However, rohit has more ability than kohli. The way he plays fast bowlers is really distinct from anybody else. I still remember the way he played Mitchell Starc in the World Cup semi final. driving, pulling him effortlessly when the guy was bowling at 150 clix. Lol he used the shafiq smile n since u r one of his biggest supporters, it reminded me of u.
Kohli has a better temperament and more intelligence. There is no doubt regarding Rohit's talent. Same as Umar. Lately he has been harnessing the talent and has become better, but there is still simply too much inconsistency. This SA series might be what makes him though, because he has done exceedingly well each time, but before that you could always count on him to deliver a few low scores. He is also yet to make much of an impression in differing conditions, which is what puts his contemporaries above him in my book. Just an opinion though. With rohit I don't think there's a question of intelligence or temperament because he does not have the issues that khotta has. Plus, when you see him bat he usually goes for calculated strokes, unlike chota who is like a restless bee, prone to a hack across the line any moment. With rohit, u feel that it was just a coincidence or just a weird spate of events that did not allow him to be the batsman that he was supposed to be. But thankfully, he is realizing how good he is now and the confidence just shows, the way he approaches the game. I don't think Rohit was ever as immature as Umar (who is on a different planet in that regard), but there was a time when he was not very intelligent with the way he went about his batting. However, opening the innings and captaining Mumbai, etc. have all forced him to take more responsibility and thus show more capability as an overall cricketer. I wish that Umar would also learn, but he seems like a hopeless case. 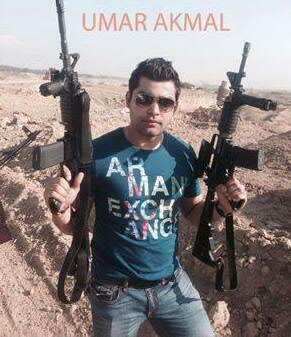 Umar has got his priorities n his mentors wrong. Careful with what you say.... DANGER. Rohit is the most dangerous ODI opener in the game. I'd take him over Amla any time, who is all stats and no substance. If you don't get Rohit out in the first 15 overs and he will more often than not take the game well beyond your reach, also he can switch gears like no one else can. Plus, he is the most pleasing batsman to watch in my book, especially against fast bowlers. He is a legitimate beast in ODIs. Probably the most dangerous batsman after ABD in limited overs cricket right now. ABD does it from middle overs onwards but Rohit to his credit stamps his authority as an opener. Be sure to see him flop next game though. One of the most inconsistent batsman of our times. Poor dress sense. Most of our players have poor dress sense. Since Jan 2013, he's averaging 55+ as an ODI opener. What does this have to do with consistency? He has high avg because when he scores a 100, he scores a big one. But he is not able to show a similar performance in almost every match, or atleast 3 out of 5 matches. Certainly has the talent as a batsmen in ODIs as you only have to look at the Big inns hes scored in this format of the game, but then he seems to struggle majorly in Tests which is abit of surprise. Also seems to enjoy playing Australia. you can see how very inconsistent he is. Inconsistency is the absence of big knocks not the presence of low scores. Rohit has in fact the ideal ODI run. He's striking big in every 3-4th game and making them count. If you have this ****** logic for inconsistency go and find it in Lara's test career as well. Massive double hundreds and a lot of nothing efforts. Hardly anyone bothers. It's about making the 1/4 knocks count big. Every time I see or hear about him performing these kinds of innings I always look passed them because I know he won't be able to duplicate it in the next match. Do you even know what consistency means??? You seem to have a hard time understanding the word. Now please tell me how scenario 1is a consistent player. No one here is comparing Lara to this guy. Just because he scores big hundreds dosn't mean he is consistent. It just means he has the talent to do so. I would refer you to a dictionary of you still don't understand. Rohit Sharma is the Lara of ODI Cricket. Scenario 2, couple of 50s. Odds of ending on the winning side contribution wise exactly half to the hundred scored. He was running threes after scoring 150 gawd you rarely see such stamina in players. He's played 18 odis since 2015 and has 4 x 100s, and 4 x 50+ scores. So he's made a significant contribution once every 2.25 matches which is reasonably consistant in most people's books. In 2014 he played 12 odis and scored 1 x 100 and 3 x 50s so scored big in 1/3 matches. In 2013 he played 28 odis and scored 2 x 100s and 8 x 50s. That's quite a large sample. Sharma is clearly a poor test match batsman (so far) but I don't think he's 'very inconsistant' - not anymore and not in the shorter format of the game. That vegetarian conditioning, Pakistani batsmen need to change their eating habits if they want to be successful like Rohit.. He is the closest batsman to inzi in terms of aesthetics and ability. One of the cleanest strikers of the ball. Seems like the phrase itself was made for Rohit. There's no doubting his talent but he lost us the game by refusing to accelerate from the 35th over.Either him or Kohli should take the blame for that self serving batting. Rohit is a beast in odi's, no doubt about it! Weak lower order means the plan is to not take much risks in the middle overs. Smith & Bailey could bat freely knowing they had Maxwell, Marsh, Wade, Faulkner in the shed. I don't see the inconsistency in those innings. He usually gets between 30-60 runs and sometimes gets big hundreds. If this isn't consistent in ODIs, then please show me the innings list of a player who is consistent according to you. Even Sachin or Viv did not get 40+ runs every single match. Scoring 30 runs is the benchmark for a good score these days? Is 40 a good score? Then name a batsmen who gets above 40 almost every innings. Rohit has gotten over 40 around 45% of times (and over 50 around 39% of times). What I want from an opener is not be content with his score in the previous game and play like a fool in the next. Not just an opener, any bastman for that matter. After he scored his 150 (in a losing match), he scored a whopping 3. After a 60+ score in Bangladesh he gets out for a duck. After his 264 he gets out for 9. After 138 he gets out for 15. You can see a trend with his batting here. He knows he has the talent, but rests on his previous laurels. I don't need to name anyone, seeing as I'm not comparing King Rohit with anyone. If you think 30 is a good score, great. India's win/loss record in the last year is testament to that sort of benchmark.